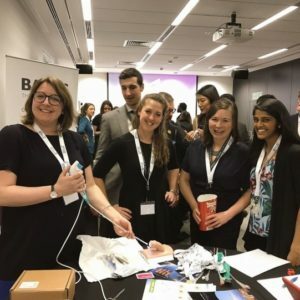 The Association of Surgeons in Training (ASiT) is a trainee-led, pan-specialty, independent body that aims to promote the highest standards of surgical training. The highlight of their calendar is the ASiT Conference, this year held at the ICC Belfast from 22nd to 24th March 2019. It attracted over 700 delegates of all grades. ASiT invites representatives of all surgical specialty groups to be part of their council. It is a reciprocal relationship as many surgical training issues affect us all and together we have a great influence. Urology’s BAUS Section of Trainees ‘BSoT’ (formerly SURG) Representative, Clare Jelley (ST5, Oxford Deanery), has done an incredible job over the last 3 years and it is these shoes that I now attempt to fill as the new BSoT/ASiT Rep. The ASiT Conference weekend included pre-conference courses run by surgical specialty groups, plenary lectures with notable speakers, breakout sessions and an impressive exhibition hall. Unsurprisingly the plenary session on curricula, credentialing and regulation was full; Charlie Massey and Prof Colin Melville (GMC) were put under fierce questioning by the ASiT Committee and the audience. The plenary talks also included a range of topics: innovation, leadership, burnout, fatigue and overcoming adversity. The latter was poignantly given by John Peter, RAF pilot and POW in Iraq (pictured). The scientific programme included research and audit project presentations. Successful abstract submissions were invited for poster presentation (grouped and marked by specialty) and the highest scoring, prize-worthy abstracts were invited for oral presentation. Accepted abstracts are published in the British Journal of Surgery. There were also social events including a 5km charity run, welcome drinks and the inaugural black-tie Gala Dinner held at the stunning Belfast City Hall. Clare and I flew the flag for Urology during the conference! The pre-conference course ‘Basic Urology Skills’ was full; we taught 16 very keen delegates interested in a career in urology from all over the UK (pictured). We included practical stations to teach skills such as: cystoscopy, ureteric stenting, scrotal exploration (using medical meat), circumcision and supra-pubic catheter insertion. We are very grateful for reps from Cook, Stryker and Coloplast for providing the equipment and to our urological trainee faculty which included Mr Trevor Thompson, urological consultant and Head of the School of Surgery in Belfast, UK. The ‘Specialty Fair’ was another opportunity to showcase urology (and promote it as the best career choice!). The room was packed. Delegates met speciality representatives and trainees, enabling conversations and questions about their surgical specialty in an informal manner. Special thanks to urology registrars Tharani Mahesan and Katie Chan who helped spread the positive message (pictured). The abstract p resentations were of a high standard; there were over 50 urology-themed posters showcased. Of particular note there were at least 4 oral presentations reflecting projects within urology – including IDENTIFY preliminary results presented by Tara Sibartie on behalf of all the collaborators, which won the Society of Academic and Research Surgery (SARS) prize. Another urological highlight was the Edinburgh Surgical Sciences Qualification prize being awarded to Katie Chan for her presentation of the #DontPayToStay campaign. This Freedom of Information request exposed that 18% of English hospitals charge for non-resident on call accommodation at a median rate of £25/night. i.e. trainees are left with a financial burden in order to maintain a safe emergency practice. By highlighting this issue and gaining support from ASiT and the Junior Doctors Committee it is hoped that these charges can conclusively be removed during the renegotiation of the junior doctor contract. Katie also brought along the youngest Conference delegate, baby Orla, who enjoyed the use of the ASiT crèche (free of charge!). BSoT is committed to representing current urology trainees but also to inspire and mentor medical students, foundation and core trainees who may be interested in a career in urology. Therefore it was a privilege to be able to represent the newly rejuvenated BSoT; perhaps even encouraging some future urologists! 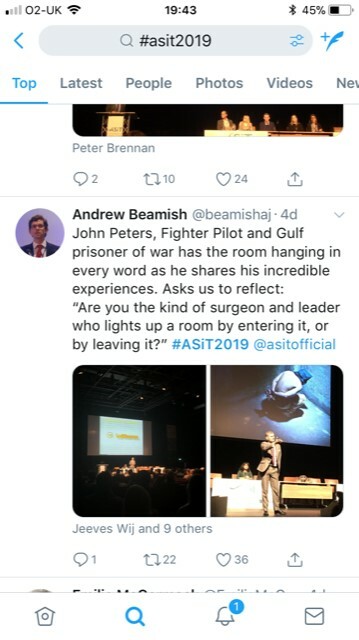 Overall it was an exciting and interesting weekend; ASiT Conference 2020 will be held at the ICC Birmingham from 6th to 8th March; it promises to be bigger and better than ever and BSoT will be there! 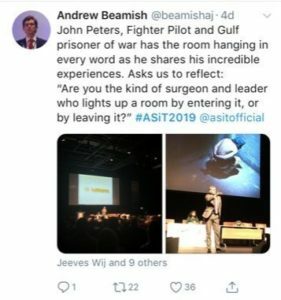 I’d thoroughly recommend all those interested in a career in surgery (and urology) to submit their projects, attend and get involved with ASiT. BSoT will also be organising events for those interested in a career in urology – so watch this space! 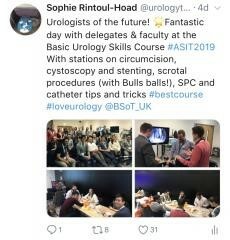 by Sophie Rintoul-Hoad, ST5 Urology trainee in South London Deanery and recently elected ASiT representative for BAUS Section of Trainees Committee (BSoT).